Donna Kato is one of the best known polymer clay artists in the world. Her name is not only synonymous with quality work, bold colors and patterns, teacher and “notable” person being the maker of “Kato Polyclay”. 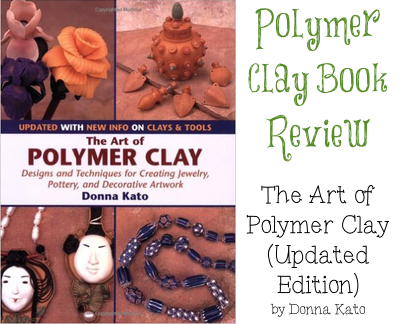 I am a fan of Donna Kato’s work, so when one of my student brought this book to their clay class [see a list of classes offered in my studio here] and wanted to show me some work they liked, I was glad to see they had already delved into the polymer world. I had the first print of this book from several years ago, however, having many students in and out of my studio through the years, it somehow got away from me. So, I repurchased this updated version recently on Amazon. When The Art of Polymer Clay first appeared in 1997, polymer clay was undergoing a revival in the U.S., but its full creative potential had yet to be explored. With this book, author and artist Donna Kato helped change all that by introducing crafters to the vast range of polymer clay techniques, from millefiori to imitative to sculpture. Today millions of people enjoy creating with exciting, easy-to-use polymer clay. Available in a tremendous array of colors and easily cured by baking in a home oven, polymer clay is a unique medium for creating a variety of beautiful items. In The Art of Polymer Clay, noted artist Donna Kato explains the basics as well as many unusual techniques, including imitative methods that can be used to create the look of semi-precious stones, woven fabric, carved wood, metal, and realistic flowers. Kato’s sense of style and color is superb, and her directions are clear and concise. –This text refers to an out of print or unavailable edition of this title. This book is a classic. Period. It was one of the first and best books of its time in 1997. It has been almost 18 years since this book was first published and a lot has changed in regard to polymer clay since then. This book is truly a gem for the polymer clay bibliophile. But if you’re not a polymer clay bibliophile, then should you bother? Because the original publish date was so long ago, much of the information has advanced well past this basic starting point. Even Donna Kato’s gorgeous canes themselves have evolved into complex and flawless canes, hundreds of times better than the canes featured in this book. The Table of Contents is nicely spread out and well placed, allowing easy look up and quick reference for future use. The “current clays” section includes the basic clays: Kato, Fimo, and all the Polyform Clays as well as Cernit (though the brands mentioned have changed since printing; such as Fimo Professional & Soufflé from Polyform). The supplies section, though obviously dated, has not changed much in the last almost-twenty years and is therefore still relevant. Some of the noticeably outdated portions include not only the millefiori cane section (as previously mentioned), but also surface treatments. Debbie Crothers & Iris Mishly have come a long way in mastering more unique surface treatments than those presented. Marie Segal’s The Polymer Clay Artist Guide far surpasses the techniques presented here as well. [See the full review of this book here.] The other section that is noticeably outdated is that of Imitative Techniques. Both Tory Hughes and Randee Ketzel have far surpassed these effects in their books Polymer the Chameleon Clay and Polymer Clay Gemstones: The Art of Deception respectively. This book is a fantastic reference for polymer clay, although a little dated at this point. If you are brand new to polymer clay, this book would be an excellent place to start as it offers a variety of techniques and projects. However, if you are into more focused work or are looking for more current Donna Kato projects & examples, the better options for Donna Kato books might be The Art of Millefiori Techniques or The Art of Polymer Clay Creative Surface Effects.